My favorite books to write are romantic comedy but with a deeper message. 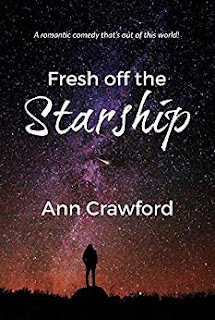 In between the chuckles in Fresh off the Starship,I talk about sexual abuse, drug addiction, PTSD in the Vietnam veterans, and other issues. Those PTSD events are true stories from some vets I’ve had the honor to know. CRAWFORD: I put out two books last year and I’m expecting the same for this year. One is called The Life of My Love,which is about finding the love of your life (something I’ve done very well!). The second book is about three generations of women: an aging hippie flower child, a bank executive, and a trans woman college student.